The National Weather Service has issued a flood warning for Fairfield County until 4:15 p.m.
“At 11:18 a.m., Doppler radar indicated heavy rain across the warned area. Up to two inches of rain have already fallen. Excessive runoff from heavy rainfall will cause flooding of small creeks and streams, urban areas, highways, streets and underpasses as well as other drainage areas and low lying spots,” the National Weather Service says. Expect the wild weather to continue Monday with heavy rain, strong winds, changing temperatures and a chance of thunderstorms later this afteroon. More than 2 inches of rain will result in some urban and poor drainage flooding. Heaviest rain is expected between 6 a.m. and 1 p.m. According to the Community Collaborative Rain, Hail and Snow Network, rainfall totals as of 7 a.m. were .89 of an inch in Norwalk, .87 of an inch in Seymour, .79 of an inch in Darien and more than a half-inch in Brookfield, Newtown, Bethel and Milford. There is a slight chance of T-storms until 4 p.m.
Coastal flooding will remain a concern for vulnerable areas during times of high tide. A coastal flood advisory is in effect until 2 p.m. for southern Fairfield and New Haven counties. Tides are expected to be up to 2 feet above normal late Monday morning into the afternoon. Elm Street in Stamford is closed from Cherry Street to South State Street because of flooding, Stamford Police said on Twitter. Newfield Drive is also closed from Newfield Avenue to Shadow Lane due because of downed wires. Darien Police also reported flooded roads throughout the town. Milford Police said Post Road at Roses Mill was down to one lane, and that several other roads had heavy ponding, but were still passable. 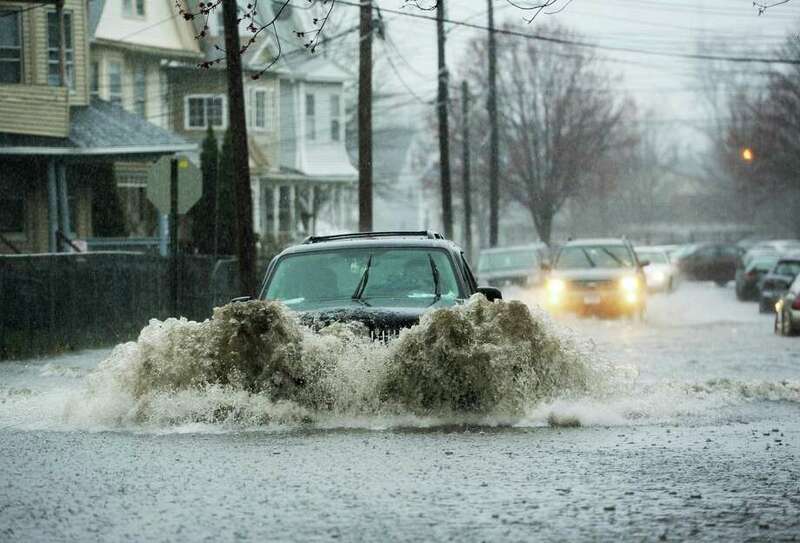 Bridgeport city officials warned of flash flooding in low-lying areas and recommended motorists to avoid flooded streets. Winds may occasionally gust close to 40 mph, with the strongest winds expected along the coast. Winds will remain gusty even following the frontal passage. At 6 a.m., wind was gusting to 37 at White Plains airport, near Greenwich, 36 mph at Sikorsky airport and 24 at Tweed-New Haven Airport. A wind advisory is in effect until 8 p.m. for northern Litchfield County. East 20 to 30 mph withs with gusts up to 55 mph. Winds will increase this morning and remain strong into early this evening. Isolated power outages are expected due to the strong winds. Conditions will begin to improve from west to east by late afternoon into the evening as a cold front moves through. Despite highs in the mid 50s to near 60, strong northeast to easterly winds will make it feel as though temperatures are in the mid 40s to lower 50s. Monday: Showers and possibly a thunderstorm, mainly before 5 p.m., then a chance of showers and thunderstorms after 5 p.m. Some of the storms could produce heavy rainfall. High near 56. Breezy, with an east wind 16 to 24 mph, with gusts as high as 34 mph. Chance of precipitation is 100 percent New rainfall amounts between 1 and 2 inches possible. Monday night: A 30 percent chance of showers, mainly before 8 p.m. Mostly cloudy, with a low around 38. South wind 8 to 14 mph becoming west after midnight. Tuesday: A 20 percent chance of showers after noon. Mostly cloudy, with a high near 50. West wind 9 to 11 mph. Tuesday night: Mostly cloudy, with a low around 35. West wind 8 to 11 mph.